Barrel Vault Roofing Delivers Looks And Performance That Last! 10x Lighter, 20X Stronger And 100X More Compact Than Traditional Barrel Tile Roofing. When compared with conventional clay and cement barrel tile, our roofing is exponentially lighter, stronger and more compact! Our stone coated steel metal roofing is not only the toughest, but also one of the most lightweight roofing materials available, and weighs only 1.5 pounds per square foot. IN new building construction Gerard roofing weight savings can translate into significant building cost savings. On existing buildings the material strength and weight savings make Gerard one of the safest roofs in seismic regions and a great alternative to traditional concrete and clay tile which weigh as much as 15 pounds per square foot! The difference between using Gerards lightweight stone coated steel metal roofing over concrete or clay roofing products results in almost 10 times less weight pushing down on your homes structure. See what architects say about how Gerard metal roofs can save money on new building construction! Gerard stone coated steel metal roofing is designed and built to withstand the harshest of elements for a minimum of 50 years, guaranteed! Our metal roofing is made from 3/16 galvalume coated steel – the most workable and durable metal roofing material available. 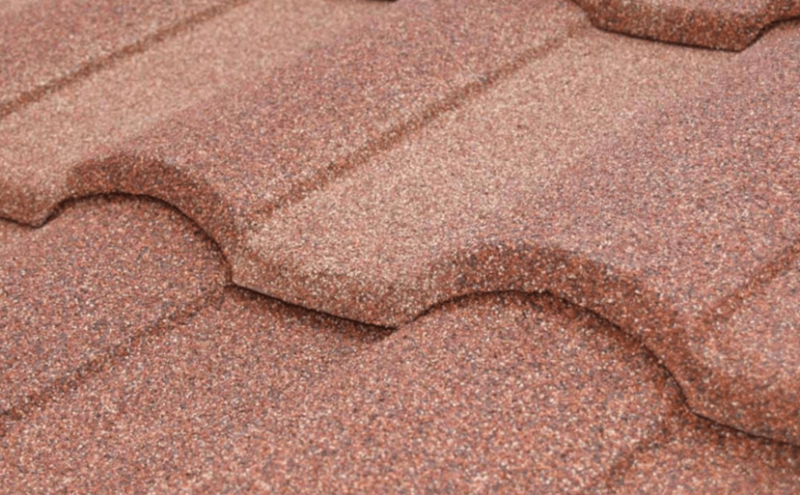 Combine this with our highly durable and generously poured-on acrylic base coating embedded with poured-on stone chips, and you have the most durable and attractive roofing material available. Unlike traditional barrel tile roofing Gerard’s Barrel Vault metal roof panels will never crack or or break, and you will save alot of money and time in cleaning and repairs! The classic looks of a Gerard Barrel Vault metal roofing system will stand the test of time, and always look beautiful. See how our metal roofing is built to last!